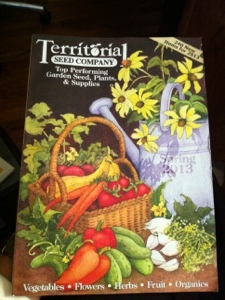 So far I’ve only received the Seed Savers Exchange catalog, but if it’s like last year I should be getting catalogs from places I’ve never ordered from. A couple times I’ve heard of a number of seed companies being bought over by large companies like Monsanto. I really need to pay closer attention to that and remember the names involved. Reducing the number of seed suppliers is not a good thing, especially if Monsanto and their ilk are the ones doing the buying. I just heard of a study where it was estimated that the average American unknowingly eats about their own body weight in genetically modified foods every year- and that was only looking at GM corn, soybeans, and sugar beet made products. I’ve thought of but haven’t yet tried planting any root crops. I have planted a few carrots and they are still hanging in there outside. My yet to be transplanted potato plants are growing quite well in what is a very shallow pot. I have no idea what’s going on under the soil yet, but when I transplant the two of them I’ll find out. I have some seeds that produced some very yummy, if small, carrots last year. I went to see a friend in a show in New Haven, and there was a restaurant we all went to afterward. At the cashier’s stand was a small bowl with carrot and pumpkin seeds. These are the pumpkins that grew in my front yard last summer (2011) and went so wild I didn’t invite them back the next summer. The carrots though produced some sweet little things that I still have in containers in the back. I believe I still have a handful of seeds left from that packet. They’re a little older but I think they still should be fine. Perhaps a seed exchange is in our future. My experience with root crops has been mixed. The soil in this region is very clay like and, for me, has produced mostly deformed root crops. I’ve tried beets a couple times, and that was enough to know it’s not the best in-ground crop for my Brooklyn backyard. This is why I chose container planting for the carrot seeds, and the results were pretty good. Like I said, although they weren’t misshapen the way my beets had been, they were still rather small; that could be owing to a variety of reasons, all of which I’m sure I’ll never know. I’m very curious about your potatoes. If it works out, I may try the same thing (although I just started the Dash diet which bans starchy veggies, at least for these trying first weeks). In any event, I love the idea. Keep us posted! I just got my Park Seed catalog today and couldn’t resist looking through it- a few times. Not daring to put it on paper I started making a shopping list in my head. What is it about those small glops in envelopes that is so addicting? At work I am up to 3 plants on a shelf, although one of them is to be given away. One cactus and a wormwood are to be the permanent residents there. I am thinking of starting a vine from a cutting which has been happily growing inside at home for a few years now. That should make a nice addition. I am also thinking of replacing the dim fluorescent light under the shelf with a grow light, but I have to check what size bulb the fixture takes. When plant #3 showed up this past week one of my co-workers printed a small sign, “Ralph’s Plantation”. I penciled in “Saving the planet one plant at a time”. For now I have been supplying the plants with light from a bright flashlight, but a grow light should be easier and probably work better. I have an unused timer I could put on the grow light. I read plants need at least some time in the dark to stay healthy. I finally transplanted my potato plants into a deeper clay pot. No signs of new potatoes yet but it’s probably too soon for that. They developed a nice root system which is a good sign. just keeping what I have alive until spring- and deciding what to plant when it gets here. I recently listened to a good podcast about seeds and seed saving. The show http://www.thesurvivalpodcast.com/1054-how-what-and-why-saving-seeds runs over an hour and touches on GMO seeds, hybrid seeds, and root crops. This was one of those programs I kept to listen to again, unlike most which I delete from my player as soon as I listen to them. If you save, or are thinking of saving seeds check it out.